Hidden within the pages of illuminated manuscripts, books of hours and breviaries, intricately illustrated botanical specimens have formed an integral part of medieval manuscripts and religious iconography and later, the Renaissance aesthetics. They illustrate botanical symbolism and its Christian orientation and enhance the visual beauty of a work on paper. For Mariology students (THEO 3215) of Prof. Andrea Florendo as cross-curricular Mary Gardeners, they constitute intriguing footnotes to the larger but related subjects of art, botany & theology. 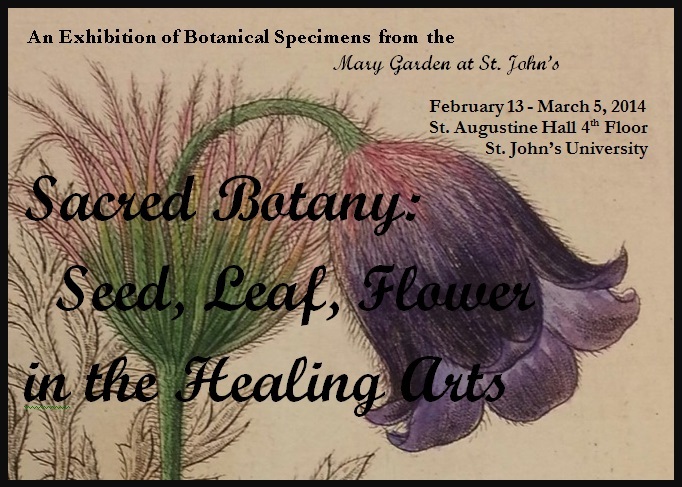 Their Academic Service- Learning and participation in Learning Communities events lead in part to artistic documentation and record-keeping of botanical specimens from the Mary Garden at St. John’s habitat, and preserved in a herbarium at St. Albert’s Hall for research purposes. Several works from the Library’s Special Collections showcase images of plants that are used to sustain not only the body, but the mind and spirit as well.